Device removing water from a pit dug in the ground in order to evacuate it to a sewer or septic tank. Moving part connected to the shutoff switch; it rises with the water level and activates the pump. 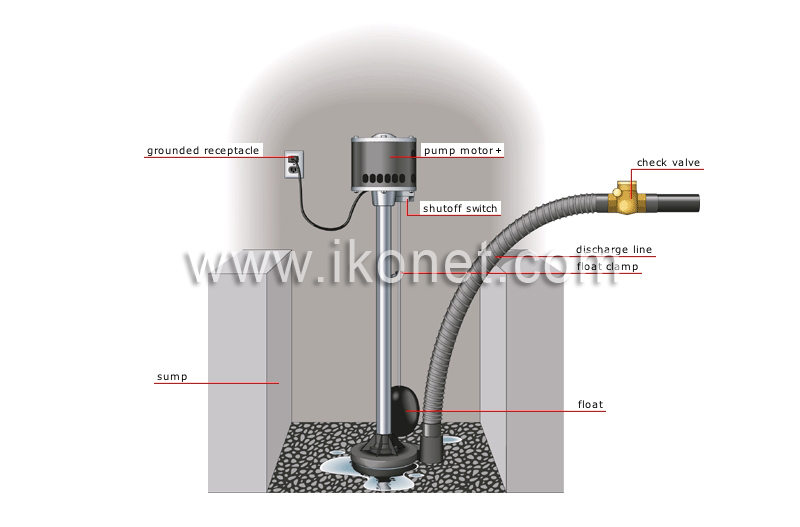 Pipe through which the pump evacuates the sump water to a sewer or septic tank. Valve with a toggle preventing water from backing up into the sump. Mechanism allowing the pump motor to be activated when the float reaches a preset level. Pit in which water runoff is collected in the event the basement floods. Metal part keeping the float line in place. Device for supplying electricity and ensuring the transfer of the current to the ground in the event of device malfunction; it prevents electrocution. Device transforming electric energy into mechanical energy to drive another device.